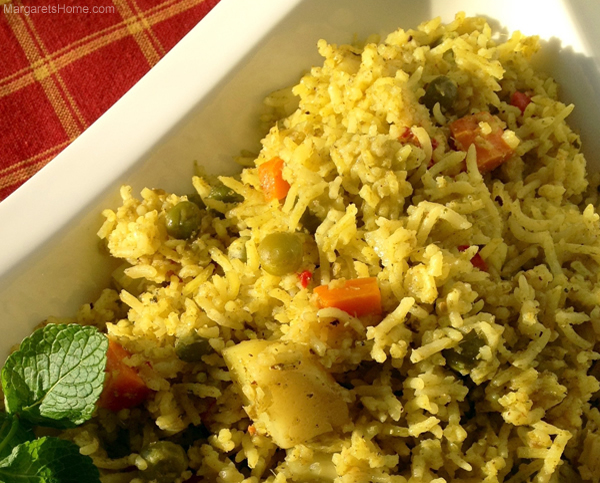 This entry was posted in Rice, Vegetarian and tagged Coconut, indian, Rice, vegetables by Margaret Christo. Bookmark the permalink. It is wonderful to hear from you. Thank you for keeping up with my blogs. Happy thanksgiving. I know you are going to be very busy cooking for your family. I miss you and I promise to stop by before Christmas. Give Lucas a big hug for me. You made my day I will be thinking of you while I begin my prep work for our big thanksgiving dinner on Thursday. Love you and God bless. Sounds sumptuous ! Will definitely try. Thanks. Love, Pris. What’s the menu for your big thanksgiving dinner? Good to hear from you. I’ve started doing the prep work for thanksgiving dinner today. Will send you the menu. Depending on how everything turns out will share pictures and recipes. Wish all of you were here. Wow the vegetable biriyani is just fantastic! My kids who don’t like vegetables very much gobbled up the rice and Doug thoroughly enjoyed it too! I left the chillies out and fried some chillies on the side for myself! Thanks so much do sharing! Can’t wait for the next recipe! What a lovely message at the end of my busy day. I’ve been cooking and cooking for tomorrow’s thanksgiving dinner. We have about 25 people coming. Thank you for your feedback on the Vegetable Biriyani. It is always wonderful to hear from you. It broke my heart when I heard about Dr. Baliga, but as you said, we have beautifully memories of her. She loved to join us during our Friday evening worship. I was happy to hear from Steve recently. Thanks for keeping in touch. Love you always.